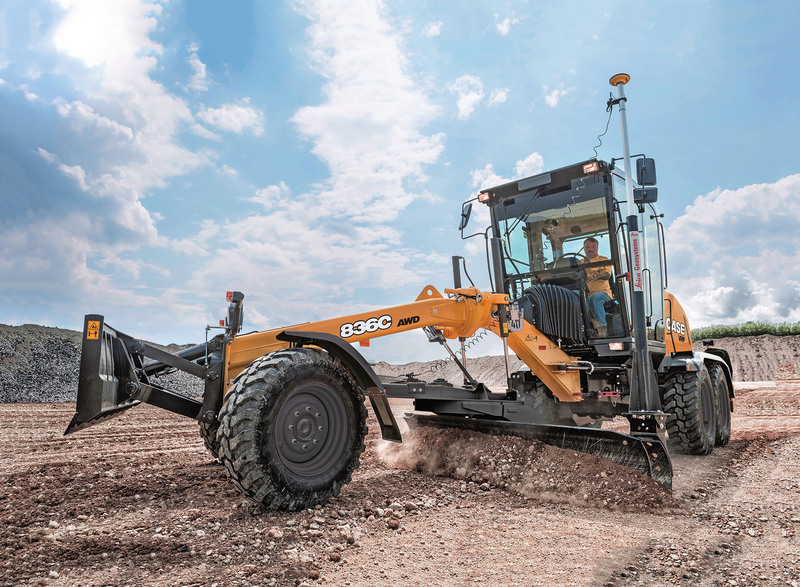 The 836C and 856C motor graders include several innovative features that help simplify operation and allow operators to focus on precision and jobsite safety. An Ergopower transmission and torque converter provide smooth automatic shifting, and a 100 percent automatic differential lock combined with automatic no-spin power splitting instantly transfers torque from a slipping tire to one with more traction without any operator intervention. The AWD models feature a “Creep Mode” that engages just the front wheels at the push of a button, allowing the machine to move at extremely slow speeds for finish grading and applications with exceptionally tight tolerances. The 836C and 856C motor graders feature one of the most intelligent high-precision load-sensing hydraulic circuits available on the market. A direct-activated axial piston pump delivers only the required amount of hydraulic pressure where it is needed. The control valves provide pressure compensation, allowing the moldboard to be lifted or lowered in parallel, when both at full stroke, preventing unintended slope loss due to hydraulic flow/pressure differences from side to side. A high-flow floor switch allows the operator to obtain maximum output from the hydraulic circuit at any time during operation. Direct-mounted hydraulic controls increase lever rigidity and reduce play in the system, giving the operator positive feedback and better control from the hydraulic system during precision applications. An exclusive A-frame drawbar provides superior stability due to its heavy-duty boxed frame design. The roller-mounted encapsulated circle is activated by internal gearing, which minimizes wear and increases the lifetime of its components. 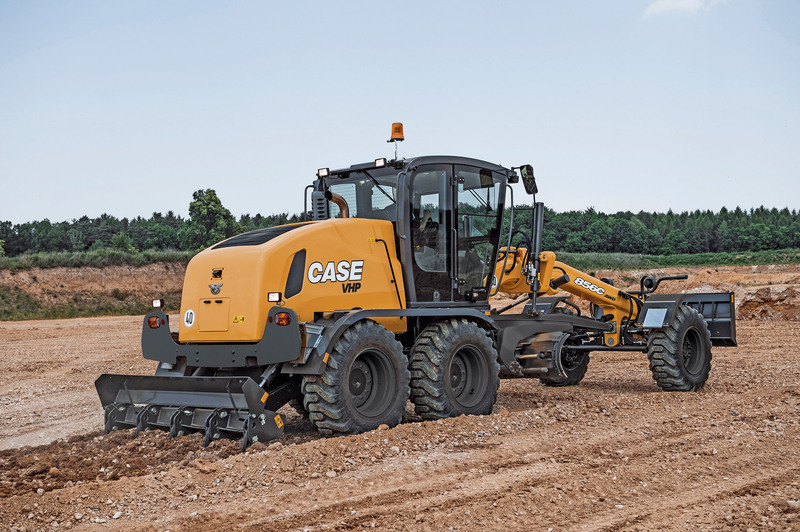 CASE C Series motor graders feature a high-carbon steel moldboard, and new moldboard mount and slide system, with minimized opportunity for play and fewer grease points. The moldboard is designed to pitch, tilt and move laterally, and can be expanded with available horizontal and bilateral extensions which further expand material retention capability for super fine grading applications with optional precision machine control. A hydraulically controlled five-position saddle allows operation at over 90 degrees. 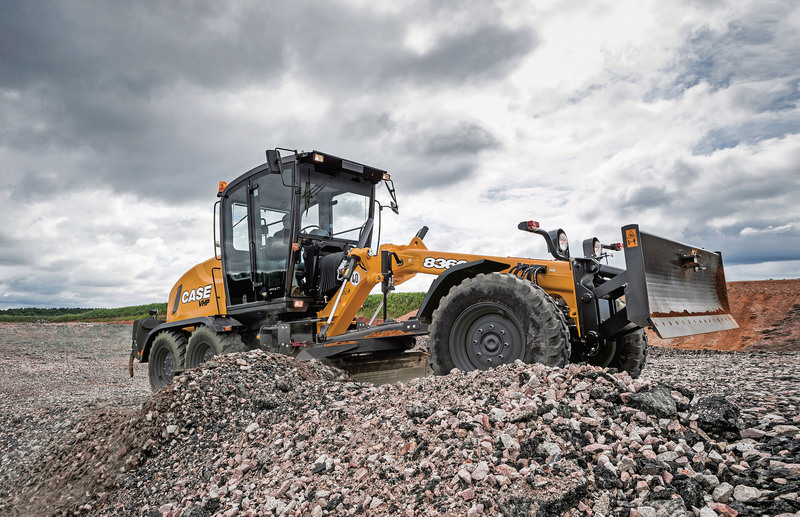 The C Series motor graders are available machine control-ready from the factory for all major suppliers of machine control technology, including CASE precision partner Leica Geosystems, as well as Topcon and Trimble. This allows the 836C and 856C to be deployed, straight from the dealer, into any fleet-wide precision or machine control solution an owner/operator/contractor may deploy on their worksites. Additional options include heavy-duty tires, a dozer front blade and rear ripper, and an automatic lubrication system for simplified maintenance. A heavy-duty circle drive motor and moldboard float actuation are also available from the factory. A low-profile rear-mounted cab with wide tinted floor-to-ceiling windows and external mirrors offers superior visibility of the moldboard and surrounding area. The cab also features a standard heated air-ride seat and smooth, ergonomic controls. An available rear-view camera with 7-inch LCD monitor, as well as an advanced lighting package further improves safety and jobsite visibility. CASE C Series motor graders are designed for groundline and tandem catwalk serviceability. All maintenance checkpoints are located at ground or fender level—making service and daily maintenance as straightforward as possible. All C Series motor graders also come standard with CASE ProCare, which allows C Series owners to fully plan for and understand total operating costs of the machine for the first three years of ownership. ProCare is a suite of product assurances that includes a three-year Advanced CASE SiteWatch telematics subscription, a three-year/3,000-hour full-machine factory warranty, and a three-year/3,000-hour planned maintenance contract. For more information on the all-new C Series motor graders, please visit CaseCE.com.